Goodman believed that arts learning should be studied as a serious cognitive activity, but that “zero” had yet been firmly established about the field. Some of the achievements have been Howard Gardner’s work around multiple intelligences and the promotion of educational philosophies developed in Reggio Emilia. A core theme throughout has been thinking and its place within learning. Central to the act of Making Thinking Visible is a series of routines designed around authentic questions. Rather than focus on the retention of information through rote practice, the routines are intended to be tools which students can draw upon to support their learning at any time. Although it can be easy to see them as activities or worksheets to be handed-out, the focus is on repeated use, in a range of situations, in the effort to create a culture of thinking. This however is not a set list, for there are some like Cameron Paterson who have stretched it, both bringing in new routines and borrowing from elsewhere. Some of these routines include the 3 Y’s and Parts, Purpose and Complexities. The focus throughout is the development of understanding, rather than as some sort of by-product. Central to this is the notion of documentation. This can be split into four practices: observing, recording, interpreting and sharing. What is important about documentation is that it, “must serve to advance learning, not merely capture it. As such, documentation includes not only what is collected but also the discussions and reflections on those artifacts.” Gary Stager suggests that one of the easiest ways to document learning is through the use of photography. However as Silvia Tolisano touches on, there are many different ways. Whatever the form, documentation not only helps advance students’ understanding of their learning, but also provides a powerful assessment tool to help guide practice. So what about you? How do you deepen understanding and help make learning more visible? Feel free to share in the comments. 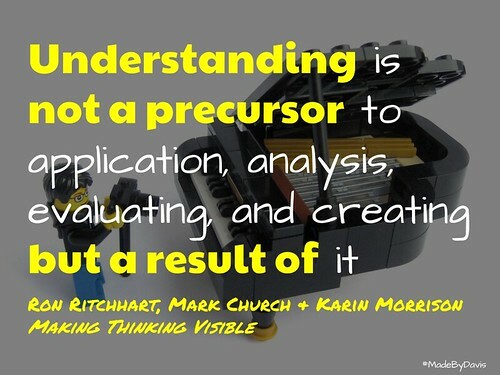 Making Thinking Visible – The first place to start is to read the book by Ron RItchart, Mark Church and Karin Morrison. This provides a thorough introduction and gives practical suggestions for each of the different routines. Visible Thinking on Youtube playlist – A collection of videos, these short pieces provide a different entry point into understanding Project Zero, Visible Thinking and the various routines. Visible Thinking website – From resources to thinking ideals, this space has everything needed to get going. It’s All About Learning – Cameron Paterson is a great proponent of Visible Thinking and has written several posts reflecting on the different iterations in the classroom. 40 Years of Teaching Thinking – A discussion by David Perkins of the history associated with thinking and the challenges that have arisen over time and still need to be faced in the future. Langwitches – From documentation to thinking routines, Silvia Tolisano has created a range of resources to support thinking in and out of the classroom. An Introduction to Making Thinking Visible by Aaron Davis is licensed under a Creative Commons Attribution-ShareAlike 4.0 International License. Aaron, this is a fantastic post. I like how you weave from Goodman to Reggio to Making Thinking Visible and join the dots between them. It’s also nice to see you connecting to Gary Stager’s ideas and Silvia Tolisano’s cutting-edge work. Thanks so much. Thank you Cameron for planting the seeds. 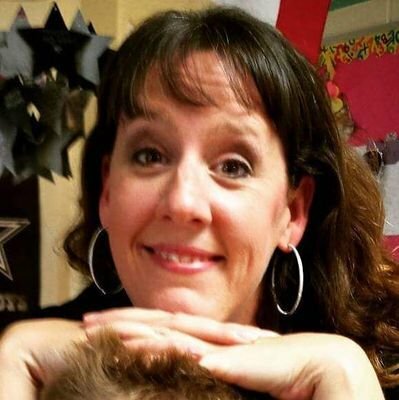 I am really loving Visible Learners and that is again taking me in new directions, leaving me with even more things to wonder about. What I really like about visible thinking is that there are the somewhat structured ‘routines’, but also the room to personalise them and make them work for your context. Providing different voices and perspectives helps highlight this I think.